Seems like the new trend in video games is for the publisher to put forth a road map to ensure that their players understand that the game may be missing something right now, but it is most certainly on the way. Had a few come up already this week, but the latest is the PC build of Monster Hunter: World. The game has been getting plenty of publicity since it was released on PC in August, including the announcement of a film adaptation of the series and a healthy push from NVidia with a free copy included with the purchase of select 1080, 1070 or 1080 graphics cards. Meanwhile, the game has been doing quite well, with high marks from our staff (PS4 review, PC Review) on a couple of platforms. 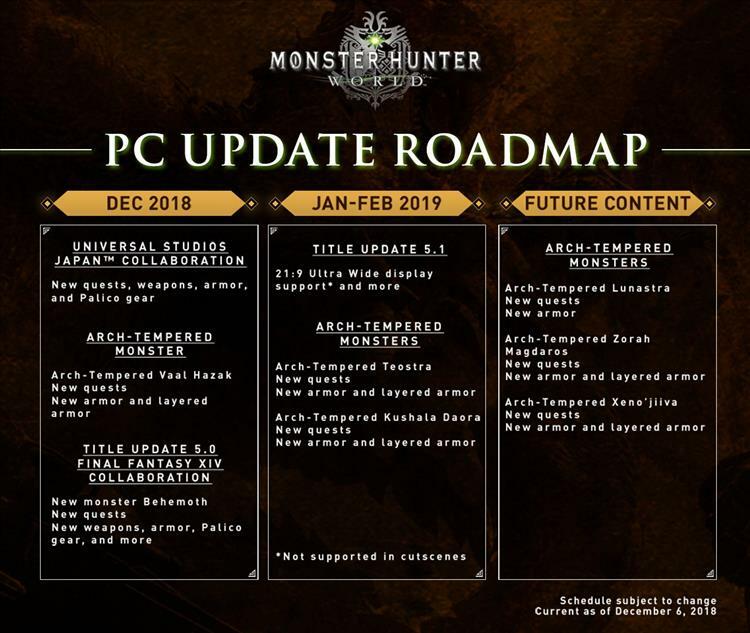 Capcom seems to understand they have a good thing, so today they dropped a graphic on Twitter that outlines the next three months and future updates that are coming to the PC version. Glancing through the list, there seems to be a lot of emphasis on new Monsters along with quests and armors for all the update time frames. There is also mention of a collaboration with Universal Japan and support for Ultra-Wide 21:9 display coming in the Jan-Feb '19 time frame. So if you have been able to pick up the game and think it may be getting a bit stale, just wait, ad there will be load of new content coming over the next couple of months.